A generous 10 oz. candle in an oversized Luxe glass. Filled with superior quality, cool burning wax that will burn for over 85 hours, leaving a lasting scent of your favorite fragrance for days. Use the sleek black lid to extinguish. Pink Magnolia combines succulent crisp Magnolia with green notes of Gardenia and Tuberose creating a unique multilayered floral experience. Yes, it is wonderful smell. Even though you do not light it. Just open the lid, and you can still smell the fragrance all over your room. I received these candle with no problem. I have been looking for this pink magnolia long time…. I was so happy to see this on web site. Thank you so much for wonderful service. I will order some more from your company. 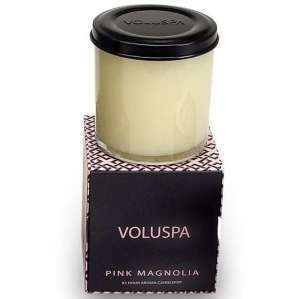 I like the quality of voluspa candles in general; they are highly scented and burn nicely. This one smells very girly; I like it but there are other voluspa scents that I like better (French Cade & Lavender is my favorite).